Way back, oh so many weeks ago when we were still in the heat of the summer, I signed up to participate in Cinnamon's BlogFest 2010 Big Giveaway. That was when September loomed far in the future and whoop there it is, smack in my lap-September 10th! BlogFest is a massive carnival of giveaways with a great collection of participating blogs. Each blog has a giveaway and the idea is to hop from blog to blog, entering all the giveaways your little heart desires. Hopefully you might even come across a few blogs you might want to bookmark and continue visiting. My giveaway is a brand-new and unopened copy of Food, Inc, Michael Pollan's Food Rules; An Eater's Manual and a copy of Mrs. Meyer's Clean Home. All very green and eco-friendly prizes. To enter leave a comment on this post including your email address. The deadline for entry is Midnight (Eastern Time) September 12th. 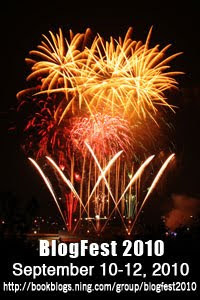 Please don't forget about the massive BlogFest 2010 grand giveaway! Head on over to http://ajourneyofbooks.halfzero.net and click on the Tracking Site link to head to our own exclusive tracking site. Once there you can register with a valid email address (to be used solely for the purpose of contacting the winner). This site will allow you to track your progress through BlogFest 2010! You can log on from anywhere at any time and continue where you left off. The best part is that every blog that you visit and mark off through this tracking site will give you one entry into the massive giveaway! We have a great collection of books, goodies and other swag that is looking for a new home!